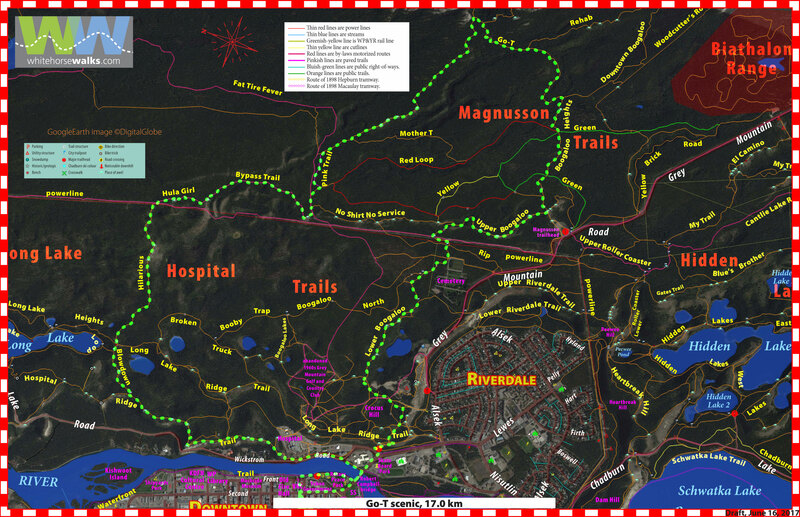 Loop walking trails, all starting from the VRC in Whitehorse. Walking for fun. 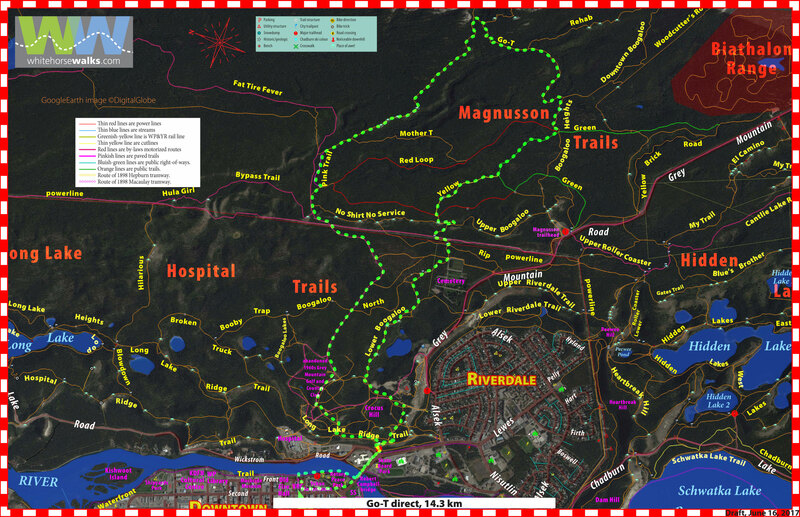 These hikes are for people who are looking for a walk starting downtown at the Visitor Reception Centre. But they're also a good resource for downtown hikers. This started as a way to offer the Canadian Volkssport Federation with a nicer local walk. Below are some candidates. Next: Thinking of best direction of travel, applying their rating system, interpreting, better short desciptions for this page and getting them well waymarked so visitors can't get lost. Then I'll figure out how to get some accepted as one of their Permanent Trails. I'll also try to come up with somef shorter ones, starting with the ones on my loop walks page, and of course the active elders page. 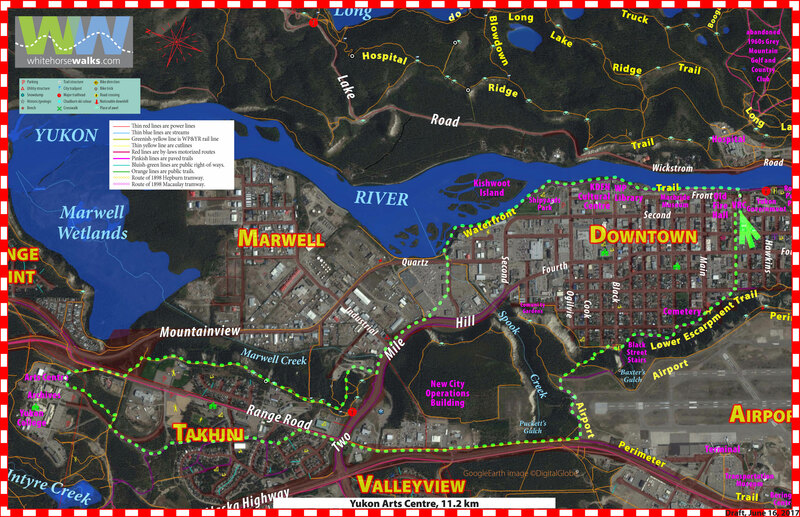 At the recent Downtown–Marwell planning sessions, I proposed the concept of these loops. When addressing the life of Downtown, we also need to be thinking about the economic value of recreational trails. 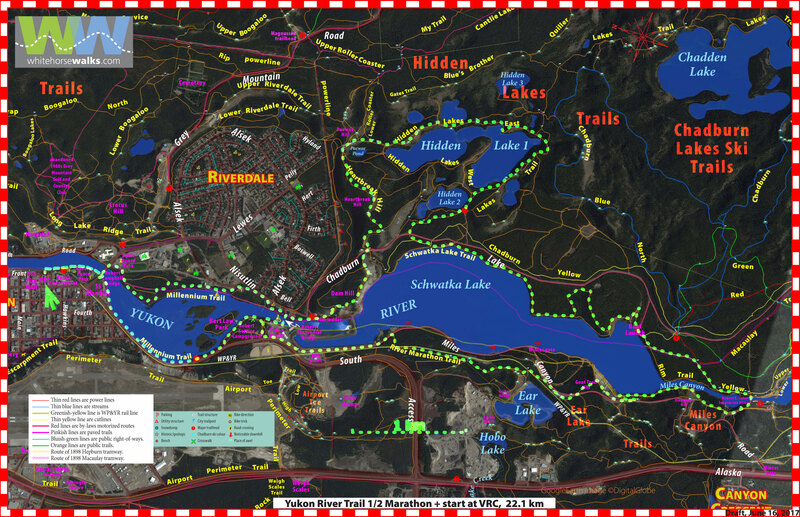 So many of the trails on the east side of the river are in Chadburn Lake Park, a fact not at all obvious from its name. For downtown walkers, it's our place of recreation, our place to connect with nature. One major item in the planning study is a pedestrain bridge to the hospital area. From Downtown it would be somewhere between Main Street and the VRC. This would really highlight the importance of these Chadburn Lake Park trails to the life of downtown. See this page for more about this current Downtown/Marwell planning process. 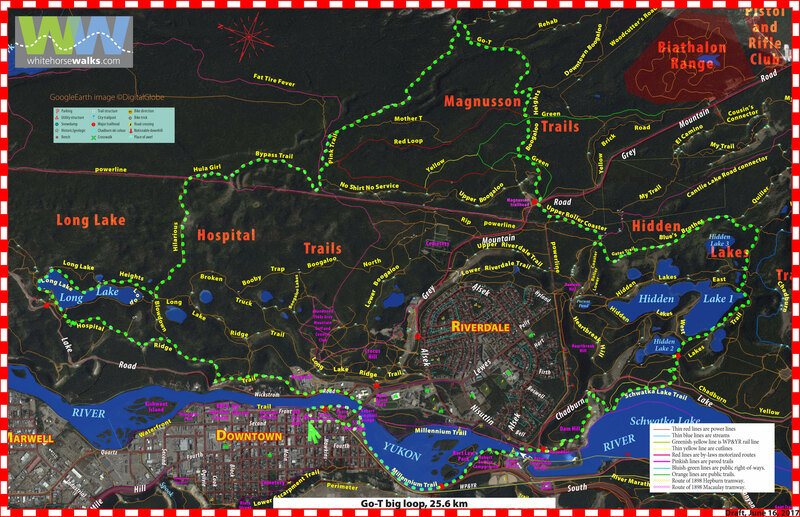 A fast way to get a nice hike in our urban wilderness, this hike is a delightful way to walk along the Yukon river, on paths along the river and on the high clay cliffs overlooking Downtown and our industrial big box neighborhoods. You'll walk on undulating glacial topography left as Glacial Lake Laberge drained over 10,000 years ago, leaving many lakes and glacial features such as eskers. 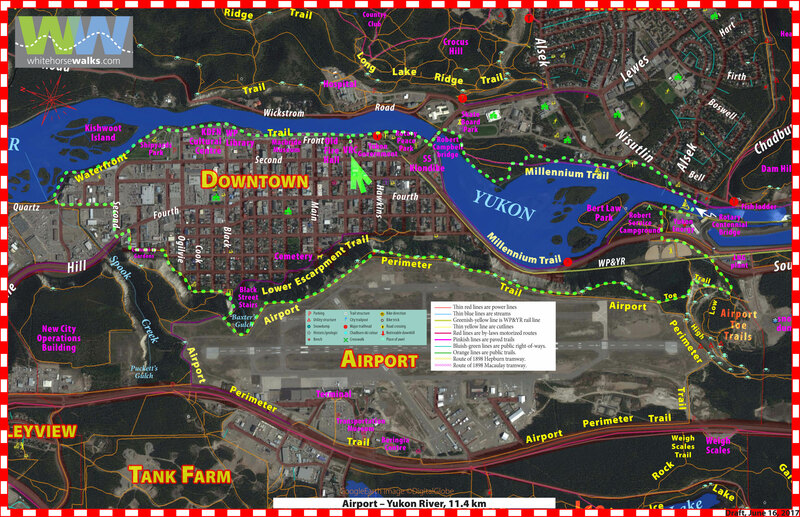 An in-town walk to the centre of culture up the hill: Yukon Arts Centre, Yukon Gallery, Yukon Archives and Yukon College. These days you'll be walking alongside some busy roads. You will however get lots of views and a look at a number of neighbourhoods. There's an area planning process happening in the Marwell this summer. It's also looking at the escarpment and what opportunites it could offer. Stay tuned. 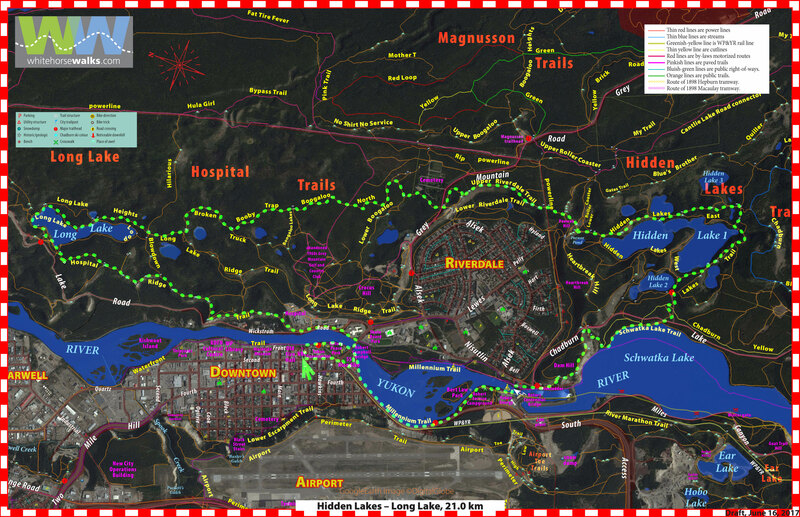 Whitehorse's version of an urban hike: waterfront, industrial, residential, airport escarpment, ball diamonds, campground, Rotary Centennial Bridge and Millennium Trail. You can visit Main Street attractions, our library, the new Kwanlin Dün Cultural Centre, Shipyards Park, community gardens, take in some of the lower escarpment parks, our very own Stairmaster and get great views over Downtown and the river valley. You can stop and see the Fish Ladder and the S.S. Klondike National Historic site, the Territorial Government building and Rotary Centennial Park. Not so long ago Whitehorse was mostly under ~1300 m of glacial ice. As it melted the valley became the very large Glacial Lake Laberge. As the the lake drained, the lake bottom was cut by the new Yukon River. We see the old lake bottom as escarpments. This hike gets us walking along the ridges made by successive escarpments created as the lake drained. Although not a very high mountain, Grey Mountain at 1494 m is one of our most prominent landmarks. This hike is a short way to get close to the ridge. Where the loop turns back downhill, you can continue a little further uphill on Mother T. Over the next few years the plan is to continue the route up to the ridge. 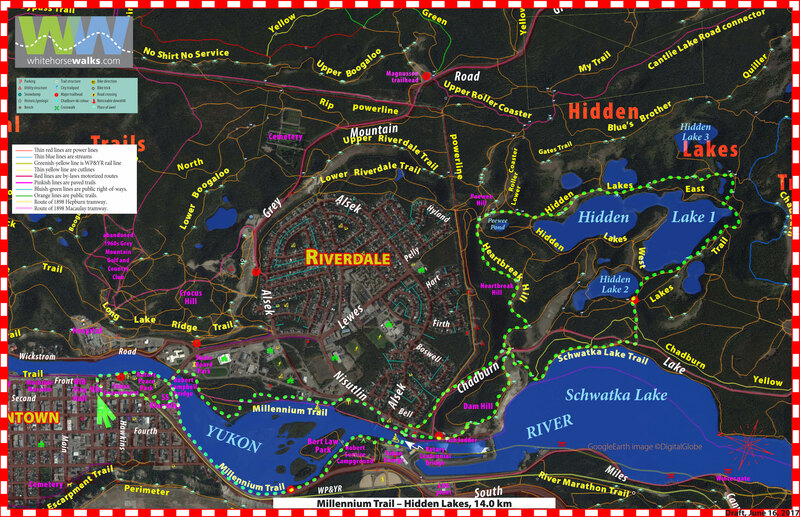 Like Go T direct, this loop gets you higher up Grey Mountain, but it takes a more scenic route back on Hilarious Trail. 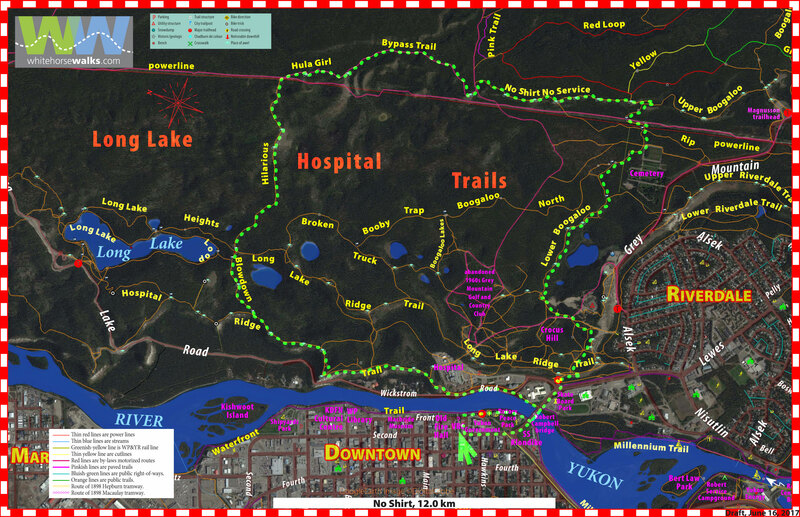 This loop of Yukon River Trail is a mix of paved Millennium Trail, with pieces along Schwatka Lake and the picturesque Miles Canyon. 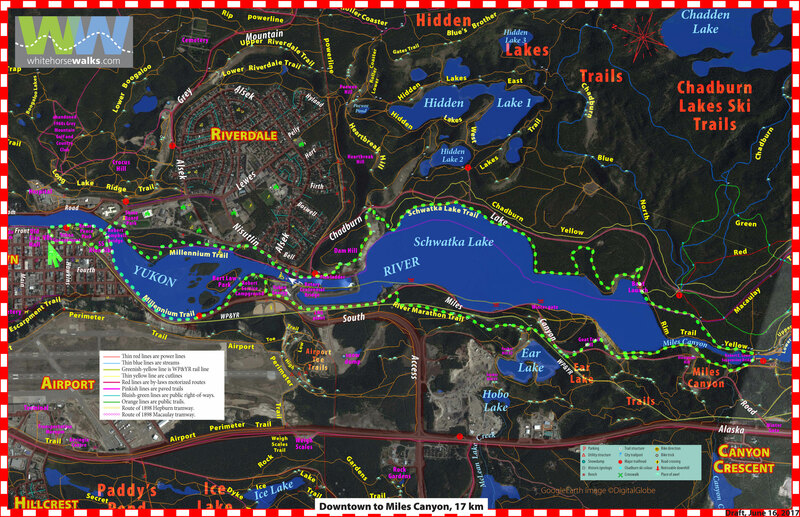 Mostly flat, it does go over some hilly spots such as the Dam Hill and a couple of pieces where the trail goes off in the woods along the west side of Schwatka Lake (it follows the Yukon River Trail Marathon route on the west shore of Schwatka and Miles Canyon). Lots of views, lots of walking on the top of scenic escarpments. 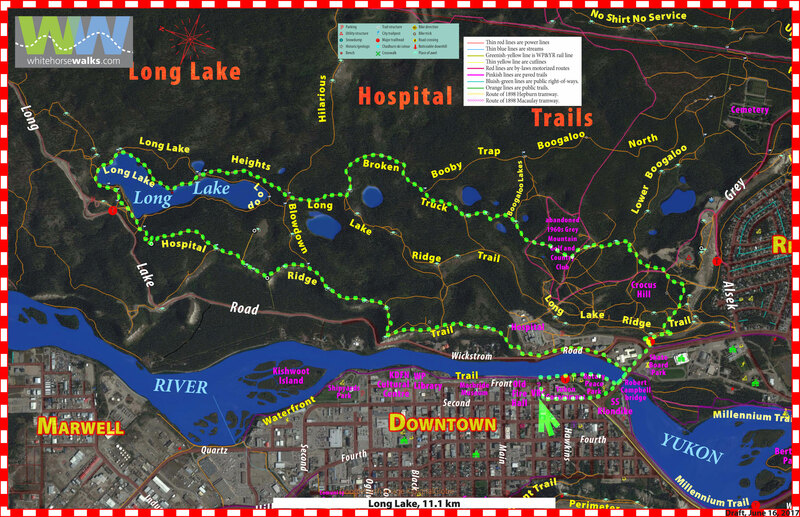 This is part of the very popular Yukon River Trail Marathon. For those wanting a longer hike, here's one! Note: Extreme weather conditions could raise the difficulty of the routes.